A Photo booth rental is all about people and people are awesome. We wanted to take this section of our website to celebrate the families and friends we have met while traveling the Inland Empire with our business. We would also like to thank the wonderful clients that make our job so much fun. 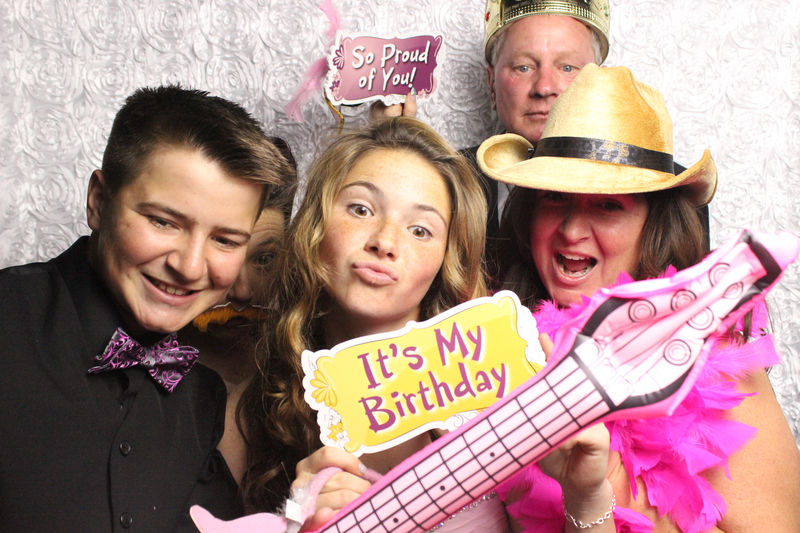 Our latest photo booth rental was for Mallory's Sweet 16. She had a beautiful celebration held at her home which was transformed into a masquerade ball. Pink up lighting and decor made the theme pop. Mallory's friends and family enjoyed the photo booth so much that the hired us for two more hours just to make sure the fun continued throughout the evening. Mallory's guests came dressed in all types and colors of masks to further enhance the theme. Sweet 16 parties are our favorite as we see families and friends having a blast and letting loose with their girls. We have seen our share of cars given now that the young girl can drive. It is a special time in a young girls life and we are glad we get to partake in this wonderful time. What is better than your Sweet 16 party? Having your Sweet 16 party with your best friend! We had a blast at this dual Sweet 16 party held in Ladera Ranch, CA. The girls and their guests danced the night away and took plenty of pictures in the photo booth to commemorate the night. We loved their red, black and white theme. We may be a bit partial as these are our colors. The festivities Thanks Mia and Lolo for letting us be a part of your milestone birthdays. We hope to be a part of more upcoming celebrations for you and your family.